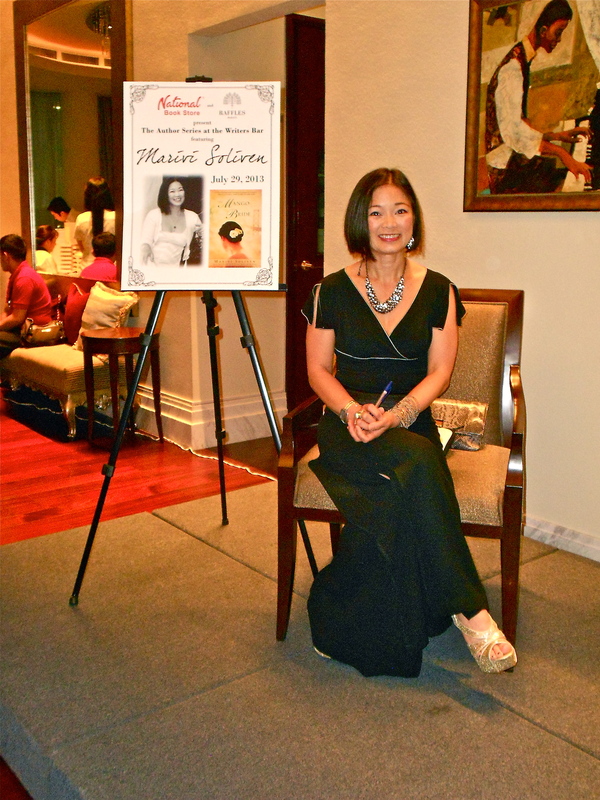 Week two of the Manila Book Tour began with full-on glamour in a cocktail party and reading at The Writers Bar in Raffles Makati. After four days of photo shoots, media interviews and nightcaps with friends at this intimate yet elegant bar, I had memorized my favorite concoctions on their drinks menu. Onstage, waiting for the reaiding to begin. National Book Store set up a lovely display. What a luxury it is to have someone else handle that task now, after doing it myself with the help of friends at each of the seven stops on the U.S. leg of this book tour! 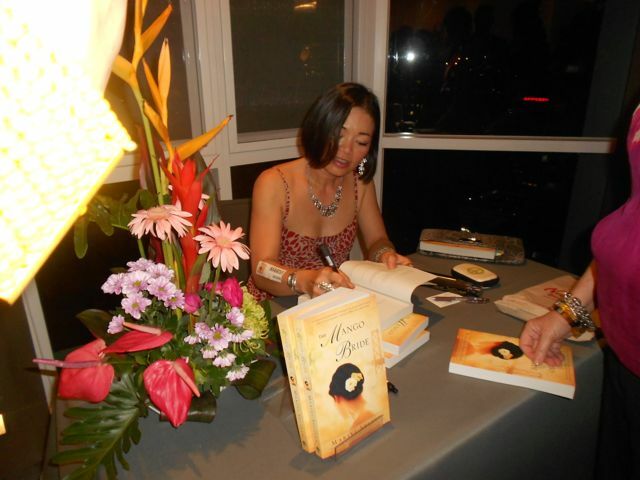 The Mango Bride display at The Writers Bar. 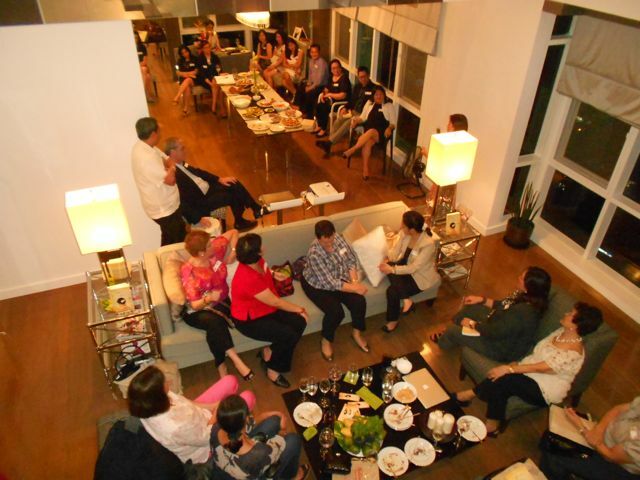 Friends from my advertising days converged to reminisce about former officemates. McCann Erickson was where I learned to edit ruthlessly and efficiently – a crucible for writers and their all-too-tender egos. 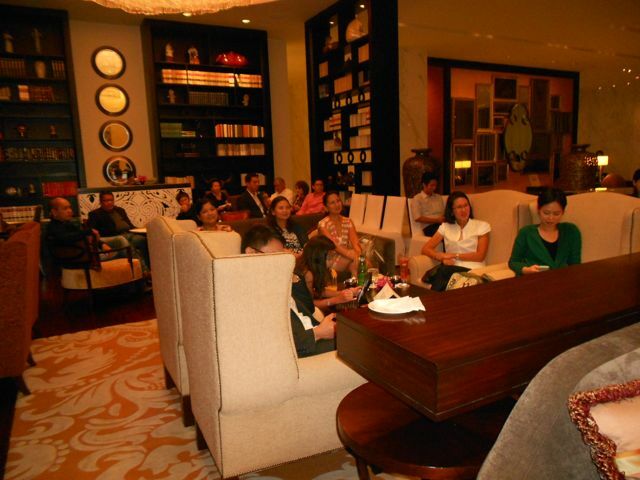 Howie Severino of GMA News took time off from his hectic news cycle to listen to the reading and ask pithy questions. Howie Severino braved the rains to hang out. The next day marked the first of my campus lectures at U.S.T. Over a hundred enthusiastic undergraduates attended the reading. From a load of photos and captions that I’d sent him the night before, National Book Store’s unfailingly efficient James Abuan assembled my powerpoint presentation – maraming salamat, James! National Book Development Board’s Neni Sta. 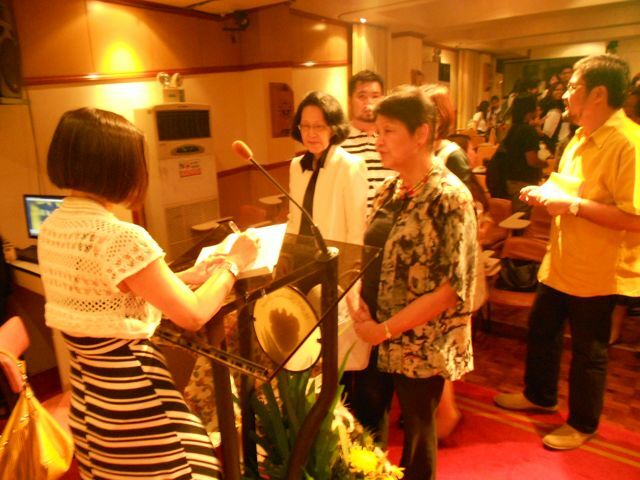 Romana Cruz chats as I sign her copy. Creative Writing Center Director Cristina Pantoja Hidalgo (in white jacket) listens in. 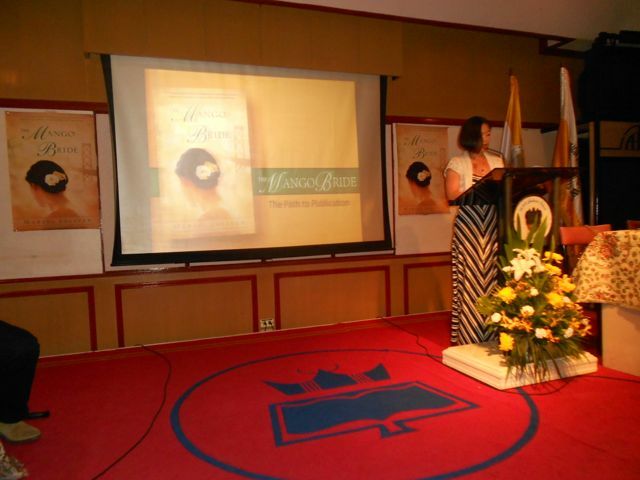 Cristina Pantoja Hidalgo’s late husband Tony Hidalgo published four of my books – including Suddenly Stateside and Spooky Mo under Milflores Press. Now that both titles are available in Kindle and Nook editions, it is such a pleasure to have been able to continue our decades’ long friendship with The Mango Bride. Roselle, daughter of Regal Entertainment’s Mother Lily, came to National Book Store’s head office with Girlie Rodis for what Gil Magnaye likes to call a “meet and greet” chat. And then the real superstar emerged: National Book Store Founder Socorro Ramos. 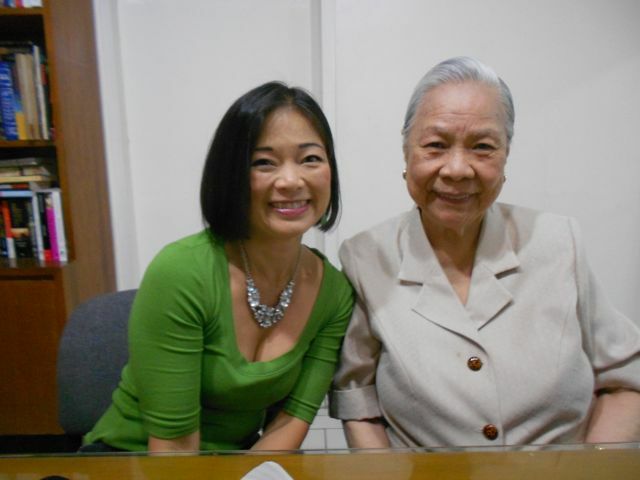 90-year old Nanay Coring Ramos still comes to work every day at the company she founded! 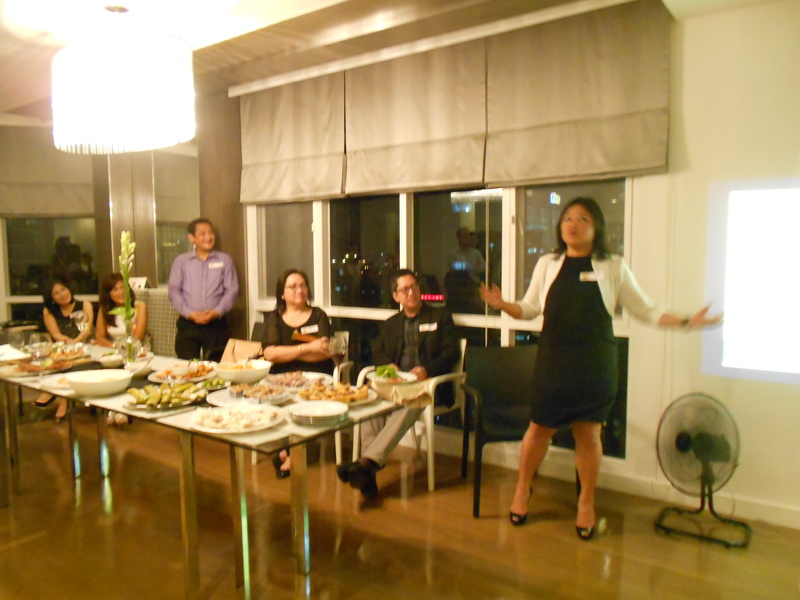 When I grow up, I want to be just like Nanay Coring: sharp as a tack and funny to boot. Two hours later, iba na ang eksena – i.e. change scene, change costume. 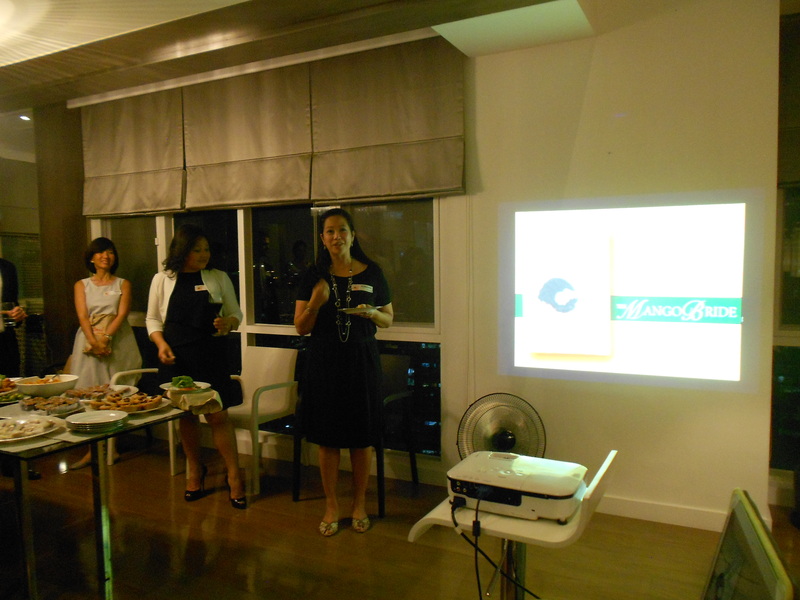 Roxanne Aquino, noted for being one of Unilever’s top 25 marketing whizzes worldwide, and Carol Dominguez, CEO of John Clements Consultants, co-hosted a cocktail party to celebrate The Mango Bride. Roxanne and I have known each other since third grade in Maryknoll, and we met Carol as undergraduates in U.P. 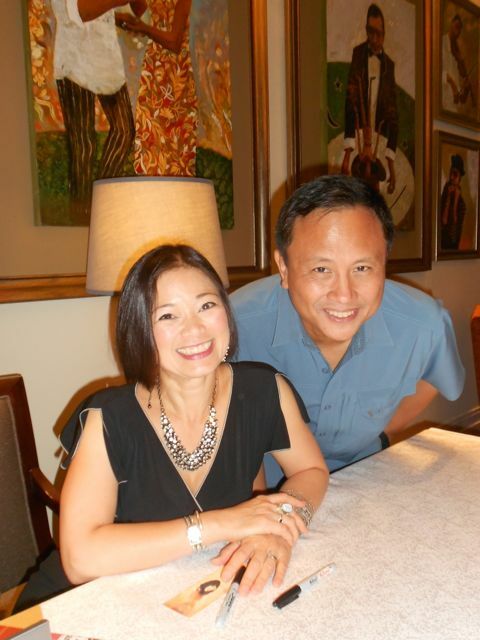 Though Roxanne and I had kept in touch all these years, it took my novel to bring Carol back into my life: she’d picked up a copy of The Mango Bride and read the entire book in one sitting, on an 8-hour flight from Sydney to Manila. A true force of nature, Carol talked Roxanne into hosting the party. When Roxanne had to fly to Scotland over the weekend on a family emergency, Carol assembled a caterer, bartender, guests and NBS sales staff. She and Roxanne even arranged for a projector so that I could present James’s powerpoint presentation before reading a passage from my novel. By the time I arrived, gown in bag, everything was in place. Roxanne proved to be an unflappable host. Jet lag? What jet lag? Carol handled the Q & A with her usual verve. Roxanne’s new condo has got to be the most glamorous private home I’ve read in thus far. By now I’ve got the whole powerpoint chatter + reading routine down pat. Everyone had name tags, but there was nowhere else I could stick it, but on my arm. 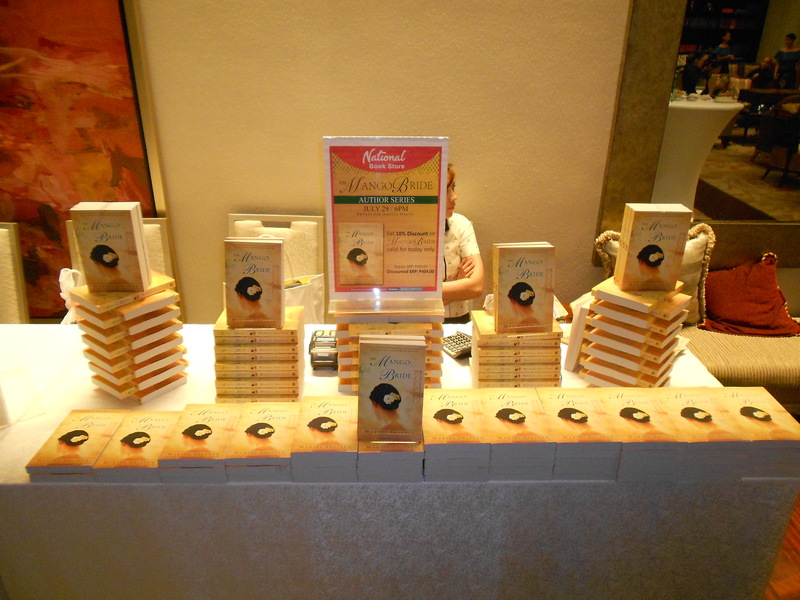 At the end of the evening, NBS’s’ salespeople told us this evening had sold the highest number of books at any one event in Manila. This shouldn’t be a surprise, since as a friend pointed out, The Mango Bride was in the hands of two of the country’s top marketing gurus. Thank you, Carol and Roxanne! 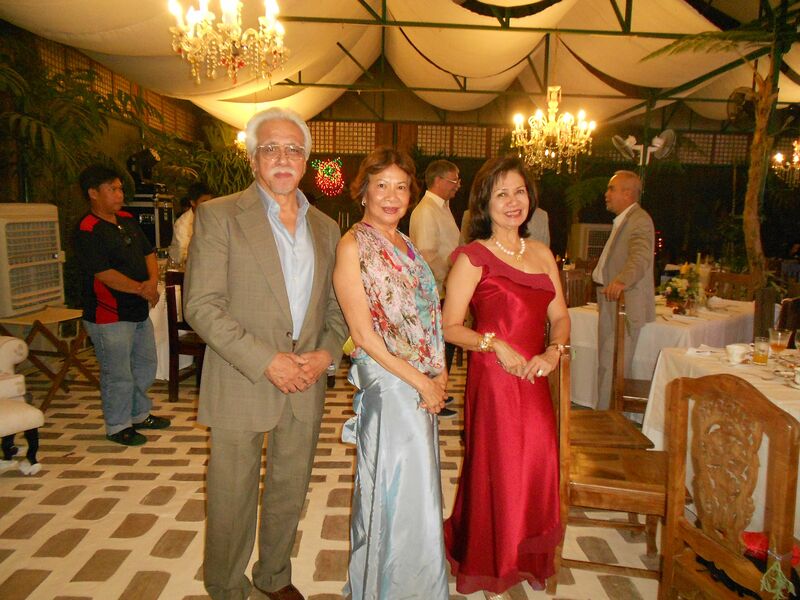 Four days of readings wound down with dinner and a concert at Sonya’s Garden, Tagaytay’s flower-drenched B&B . 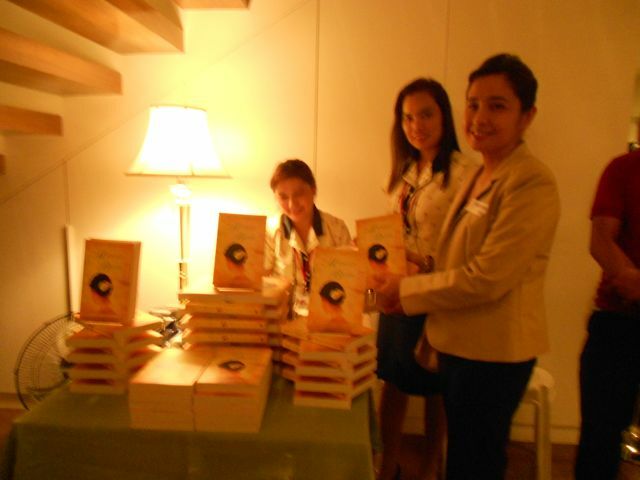 Tita Sonya liked The Mango Bride so much that she put a copy of my novel in each of her pretty cottages. 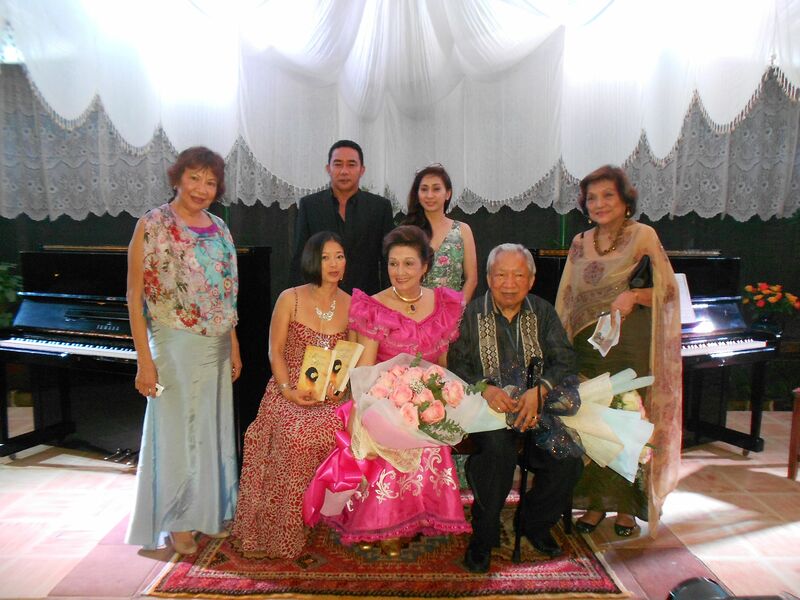 Pianists Ingrid Salas Santamaria and Nestor Reyes played two conciertos at Tita Sonya’s Friday evening soiree. 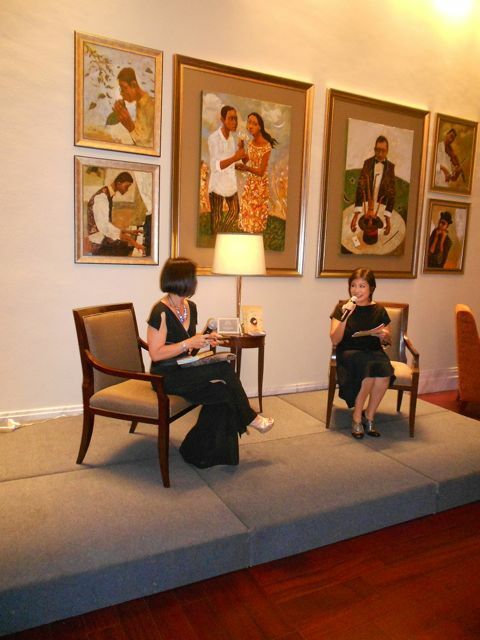 After a lively Q & A session, Tita Sonya startled me by announcing that The Mango Bride’s author was in the audience. Begging off making an impromptu speech, I bought two copies of my own book and offered it to the distinguished performers. One gown, four cities. It has served me well. Up next week: a talk about writing in my nephew’s 7th grade La Salle class, my homecoming lecture at U.P. Diliman; a staged reading (with actors!) 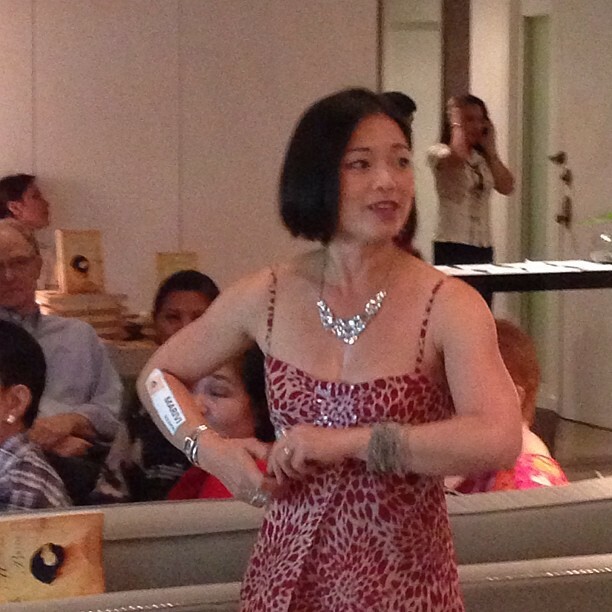 at Sev’s Cafe; and the Querida Book Launch, 6 p.m. Saturday, August 10 at Podium. 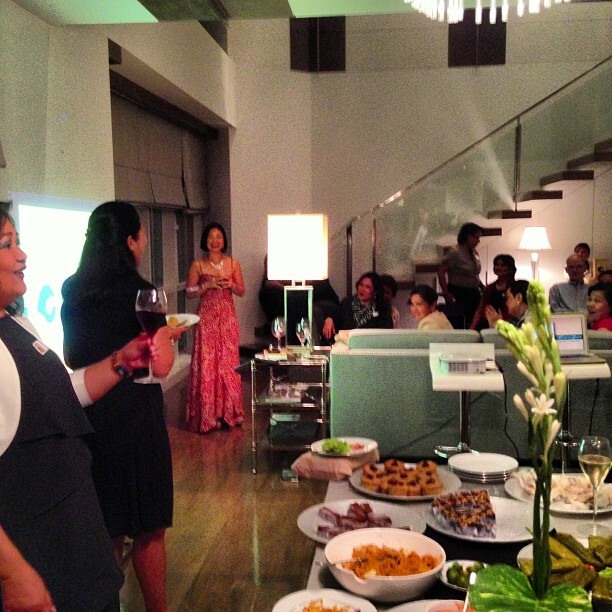 On to more reunions and parties in between….